The gold coin pictures above are present on Romanian coins through the kind permission of Mr. Laurenţiu Grigorescu. This is the second golden Romanian coin ever struck by the Romanian modern state. 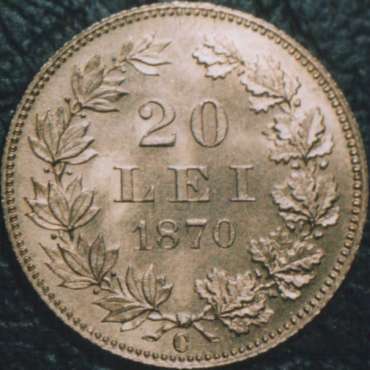 The first one (also a 20 lei, struck in 1868) was meant only for celebration and international recognition, 200 pieces having been minted only. This second one was properly destined for circulation, yet for undisclosed reasons only 5.000 pieces left the Bucharest Mint, inaugurated in the very same year 1870 (in Schäffer - Stambuliu catalog from 2009 is assumed that these coins were struck at Berlin, and Carol's effigy was engraved by Kullrich). Thus this 20 lei is again one of greatest rarities of Romanian numismatics. A piece as close to perfection as the one pictured above must consequently be worth a small fortune. We strongly believe the coin we display is one of the best remaining and we are proud to be able to picture such a collection's pride. On the 1 silver leu and on 20 gold lei from 1870 the effigy of Carol I was represented on both coins. 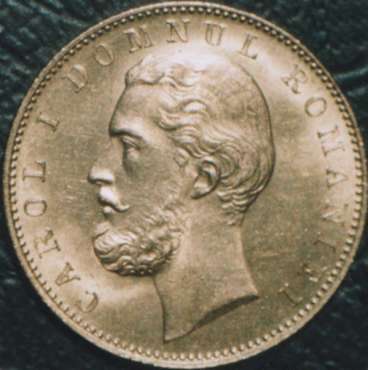 The presence of the effigy was deemed by Turkey as a sign of Romania's independence tendencies and, as consequence of Turkish protests, the effigy on the silver coins issued between 1872 and 1876 was replaced by the coat of arms or the crown of Romania.